By 2017, there will be about 3.6 billion internet users – more than 45% of the world’s projected population. The average PC/monitor combination consumes 588 kWh of electricity every year. but this doesn’t take into account that many countries with have low Internet access use lots of the word’s energy. If we look at the USA and Europe, where more energy is consumed, the value jumps much higher. This allows us to predict that the 2% figure will rise, and that the overall absolute carbon footprint will also rise as more countries get universal broadband service. Note that the biggest growth is seen in Africa, the Middle East, and Asia. North America is growing very slowly now. Confirmation of the negative effect for newsprint (meaning that it is less sustainable) and for other “broadband” activities. Negatives numbers mean that we USE more oil to prusue online activities. In other words, wtih the exception of telecommuting, many online replacements for the physical have very small positive effects, or even negative ones. From the 2009 book, How Bad are Bananas. The calculations may seem high, but that is because the author included the costs of manufacture, transport, and maintaining and operating cellphone towers and networks. “…Mr. Zuckerberg pinned his optimism on a change in behavior among Internet users: that they are ever more willing to tell others what they are doing, who their friends are, and even what they look like as they crawl home from the fraternity party. How has data center energy use grown? Between 2000-2007, data center power use doubled. Use by servers went up 10%, 90% of the expansion was the rise in the number of servers. In 2007, data centers consumed about 1% of the electrical power in the US. How much energy per YouTube video? 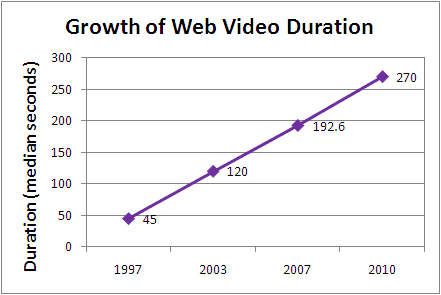 In 2010, the net carbon output of the 50 million or so daily video views on YouTube resulted was 600,000 DVDs. How much energy per tweet? According to Raffi Krikorian, a developer for Twitter’s Platform Team, each tweet sent consumes about 90 joules. That means each tweet emits about 0.02 grams of C02 into the atmosphere. How much energy per spam email? How much energy per causal web-based game? How much energy bloat per web page? How much more rich media on web pages? 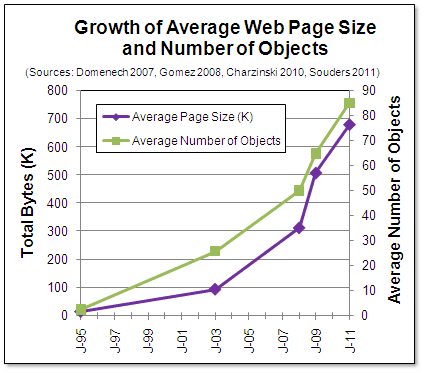 Which parts of the web page are bloating the fastest? How much more energy efficient is are LCD monitors compared to CRT monitors? For 15″ LCD and 17″ CRTs, the average power usage of the CRT was 0.57 W/in2, and that of the LCD was 0.187 W/in2. The LCD used 68% less power that the CRT on average. For comparable LCD and CRT monitors, the LCD used 74% less power on average. How much energy does a CRT use on black and white screens? A 17″ eView e17 CRT monitor consumed 0.48 W/in2 to display black pixels, and 0.65 W/in2 to display white pixels. Thus, as expected, the CRT requires more (+34%) power to display a white background than a black one. How much energy does an LCD use on black and white screens? A 15″ Planar systems model 996-0547-00 LCD monitor consumed 0.190 W/in2 to display black pixels and 0.183 W/in2 to display white pixels. Here, again as expected, the color preference is reversed: the LCD requires less (-5%) power to display a white background than a black one. How do brightness settings affect energy use on CRT and LCD screens? Both use more energy at higher brightness settings. How do contrast settings affect energy use on CRT and LCD screens? Not at all, for either kind of monitor. But high-contrast pages are more easily seen on dimmed monitors. How much energy does Adobe Flash use? These factoids (and the other resources on this site) have been very useful! I’m writing a blog post on “Carbon impact of good/bad UX” blog post, and it will be well-peppered with resources taken from your collection. One thing I didn’t find (yet) is a good energy measure for the effectiveness of CDNs and other optimisation techniques. I’d love to show how applying some WPO to a large website (code optimised, responsive techniques, CDNs etc) x 800k / page x 1 million visits/yr x 2 minutes a visit (3-4 pages) = ??? MWh saved. I’m going with 1MWh = ~1 Ton CO2 (assuming coal). Yea, I’ve been sending requests out to WPO companies, searching for case studies. So far, no takers. Ditto for traditional LCA companies who compute the green-ness of buildings, no interest and even one hostile response! The fonts question is particularly well-taken, since using webfonts via a CDN (plus making part of your interface via a font “vector sprite” should have a big impact. I may try working on a theoretical analysis like this during the next couple of weeks – if you do one, let me know. Finally, I’m looking for someone to correctly normalize the UC Berkeley CS dept study on Internet energy. They reported that the Internet uses only 2% of world power, but neglected to adjust for the fact that many of those countries have very low Internet penetration. I’m thinking that the Web Index by the Internet foundation – http://www.webfoundation.org/projects/the-web-index/ could be used for normalization. Hi, still haven’t finished my post. I’m still assembling facts and figures. Most recently I was looking for a crude measure of network electricity usage, as kwh/GB downloaded. This whitepaper on GHG footprint of internet adverts (http://evanmills.lbl.gov/commentary/docs/carbonemissions.pdf) claims 9-16 kWH / GB. If true, this gives a very handy way for amateurs like me to think about WPO – 250k saved per page on an average ecommerce site = 195 tons CO2e/year saved. (5 pages x 250kb per page x 12 months x 1million/visitors/month x 1ton CO2e per MWh (dirty coal)). But those are 2008 figures, and apparently the network is getting more efficient all the time. This is great stuff, even if it is conservative, with things getting more efficient. As for the “getting more efficient”, I’m guessing one could look at hardware to get long-term estimate. Current technology is reaching physical limits, so it seems likely we might get another 10-fold or more efficiency increase, but probably not 1,000 or 1,000,000 without something exotic like quantum computing. Combine this with the “law” that the Internet is doubling in size every 5 years – http://www.labnol.org/internet/internet-size-to-double-every-5-years/6569/ and we can see that things will add up. The impact of energy-intensive technology (often mislabeled as “green” releative to paper) remains to be seen. Web carbon footprints as a plank in theplatform?